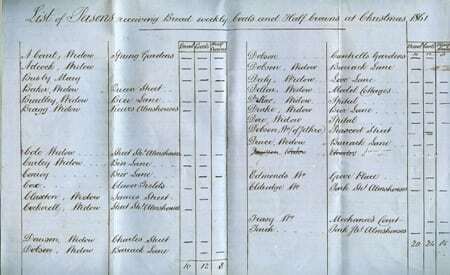 Records in St George’s Chapel Archives concerning the Dean and Canons’ local charities in the mid to late 19th century show a great commitment to alleviating poverty in Windsor, particularly during the festive periods. With the absence of any state welfare, charity handouts were often the only means of existence for the unemployed, old, infirm or the parents of a large young family. The Dean and Canons had three different types of charitable giving at Christmas time, namely one and a half quarts of coal, a weekly two penny loaf, with an extra one during the festive season, or a half crown. A list was drawn up every year of over 100 worthy recipients, of whom many were living in the alms houses of the town; 80 were to receive the coal, 64 the bread, and 45 the money, with some people receiving all three. Tickets were given out for the recipients to hand in to local traders to receive their gift, and the same names can be seen appearing over several years. There was always a long waiting list of people hoping for a vacancy, many names being suggested to the Dean by the parish vicar, curate or other local worthies. Mrs Gould was granted the bread charity, and in 1867 the Chapter Clerk noted that “Mr Cope will thank Mr Smith [baker] to find the name of Widow Gould on the list of those Widows receiving the D&C Bread Charity & let her have any bread which may have accum’d since the death of the person occ’g the first vacancy” [SGC II.M.3]. By 1872 she was also receiving the coal. She continued to receive both until her death in 1889 at the age of 90. She was a resident of Park Street Alms Houses for the entire period. Since the Poor Law Act of 1601, parishes had been responsible for providing help to those in need, but the Napoleonic Wars in the early 19th century coupled with rising unemployment as work shifted to the towns meant that the numbers of people seeking relief rose dramatically. This led to the rise of the workhouse, made infamous by Charles Dickens in his 1838 tale of Oliver Twist. The union workhouse in Windsor was built to a design by Sir George Gilbert Scott and his partner William Bonython Moffatt in 1839, and later formed part of the King Edward VII Hospital. For many of these women, it was only the help of charitable people in the parish and institutions such as St George’s Chapel that kept them out of the workhouse, and kept their families together. It was not until the introduction of the National Assistance Act in 1948 and the gradual introduction of the welfare system that there was any state-financed form of safety net for the most vulnerable people of society. The Dean and Canons and the Chapel congregation continue to make donations to external charities, both locally and wider afield; the beneficiaries of collections at this year’s Christmas services being two major UK children’s charities, ‘Save the Children’ and ‘The Children’s Society’, and ‘uk4u Thanks!’ which provides Christmas gift boxes as ‘a gift from the nation’ to all those serving in the forces overseas, away from their families.